Hey Ducky..Is someone pulling my Leg,Leg,Leg,Leg ? 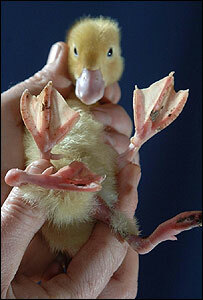 An ugly duckling has made waves on a farm – when he was born with four legs. A rare mutation has left eight-day-old Stumpy with two extra legs behind the two he moves around on. “It was absolutely bizarre. I was thinking ‘he’s got too many legs’ and I kept counting: One, two, three, four,'” she said. Go visit the Duck Farm website. Hmm, a four legged duck eh? The farm is down in the New Forest and I didn’t think there was any nuclear power stations down there. They did have a nuclear sub dock in Southampton a few months back. Apparently it happens quite often, but it still doesn’t sound right. I used to have an uncle who had a farm. I went to visit him one day and as I was walking up the track I spotted what I thought was a four legged chicken. When I got the the farm yard I spotted my uncle and went over to greet him. “Here”, I said, “I’m sure I just spotted a four legged chicken in the field back there. “Eye”, he says, “I’ve been breeding them for a few months now”. “Well there is me, your aunt and your two cousins and we all like the leg of chicken when it comes to Sunday roast”. “Great”, said I, “what do they taste like?”. He replied, “God knows, I’ve never been able to catch one”.